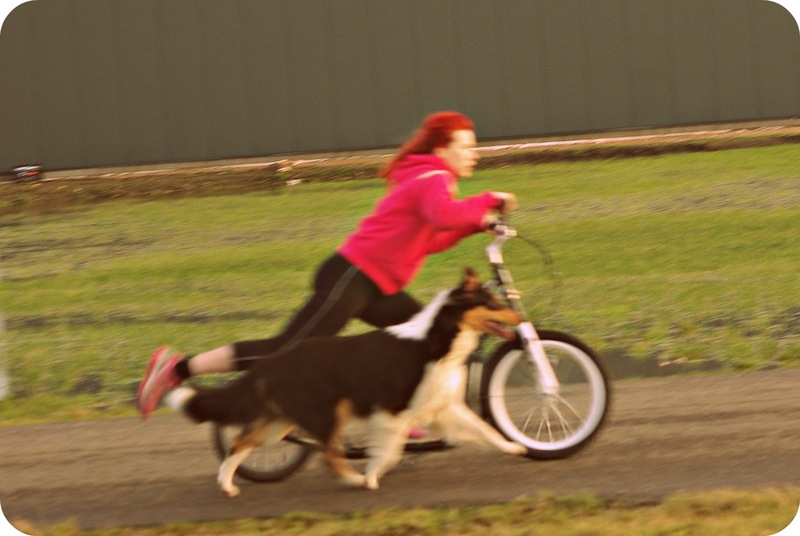 Here is an old picture of Vivien and me dogscooting, or kickbiking. I used to call it kickbiking, but I found out this sport is called scooting so I will name both terms. I've been doing this for 2 years now, and I have big fun with it. With all kinds of exercise I get somethimes bored very easily. But the dogs need their movement ofcoarse. So after a break, that lasted almost all summer I picked this thing up this week. I read somewhere about a endurece tryal, and I got curious about it. The dog needs to run next to your bike, for 20 km's, on 10 km's they will check the paws of the dog, and after the 20 km's you have to do some obedient stuff. Probably I won't go for the real tryal, but I wanted to train few of my doggies to at least 15 km's. Judy and Dita are the first dogs I will train towards more km's. They are already around 5 so we will start working that up with a km every 2 weeks. I will keep you updated over here.